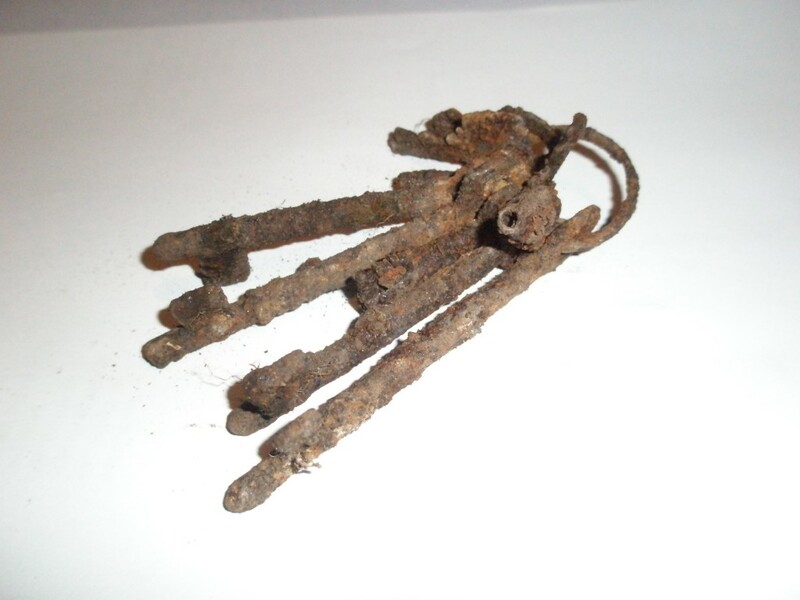 When we lifted up the old stone sink, we found these keys underneath. They need a bit of cleaning up. We found these under the old stone sink. 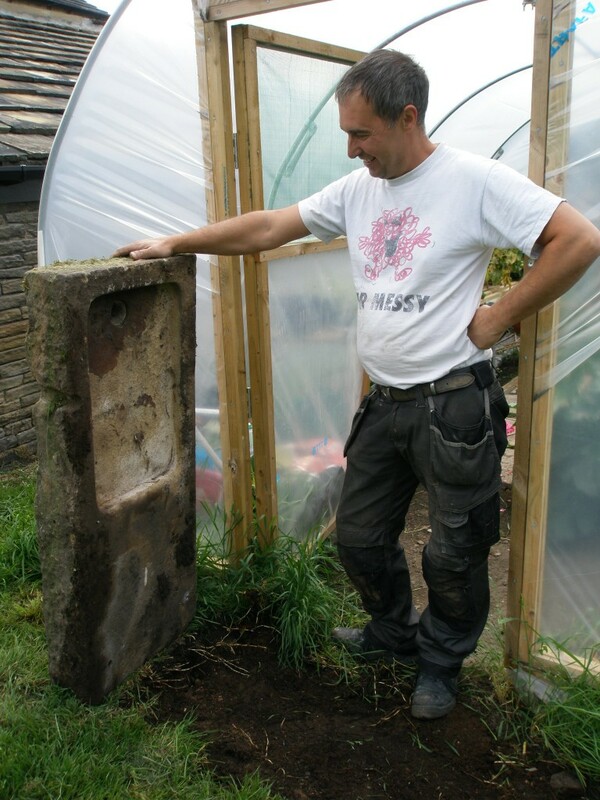 There was a large stone slab outside the old chicken shed that was used as a step. 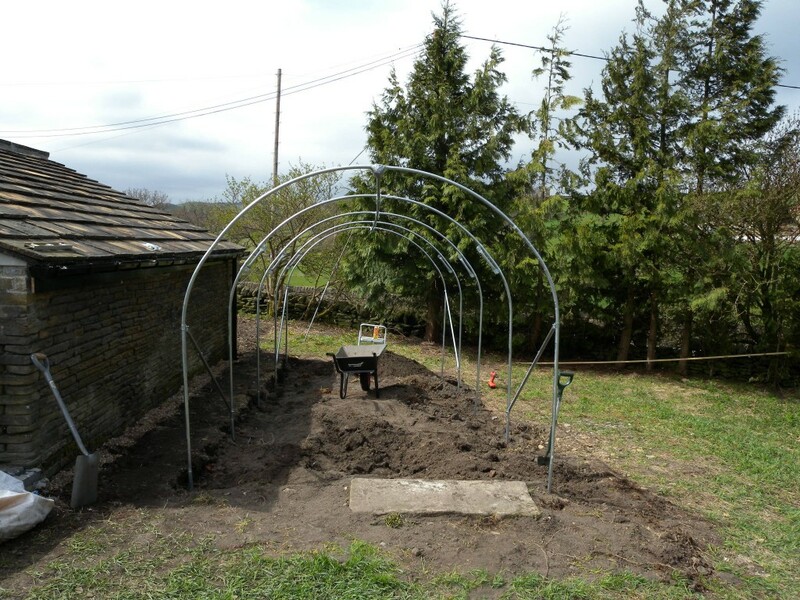 The stone slab was so heavy that I couldn’t move it, so when I erected the polytunnel, I only managed to move it a few inches. 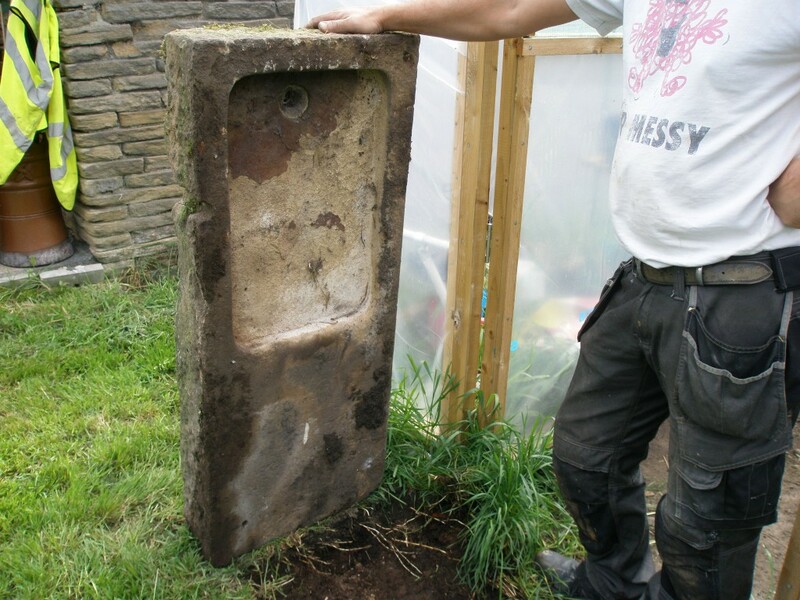 We suspected that it was an old sink as it had a hole in it that was lined with lead. But again, it was so heavy that I couldn’t flip it over. Today with the help of Richard Morson (Mr Messy), we managed to flip it over. And yes, it is an old stone kitchen sink. We aren’t quite sure what we are going to do with it, so we straightened it up and left it where it was – as a step just outside the polytunnel. It takes a couple of hours to get the hoops and ridge pole installed. Then the corner stablisers are installed.The stone step from the old chicken house needs centering. It took two of us to flip this over. This is an old stone kitchen sink. Probably dates to the original house. It has a lead sink hole, but had been turned upside down and was used as a step into the old chicken shed. I bought a metal detector some time ago and we decided that this weekend (with the fine weather and the Bank Holiday) would be a good time to give it a whirl around the top field. It didn’t take long to find stuff, but it wasn’t exactly treasure. In fact, there appears to be a lot of bit of ferous material in the field, so we turned the sensitivity down and only search for non-ferous metal. 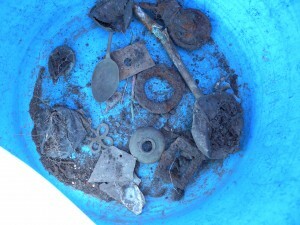 No coins or gold, just half a spoon and an old trolley wheel! But I can see how people get addicted to this as a hobby. 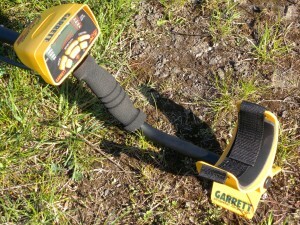 Garrett EuroAce Metal Detector. It discriminates between ferous and non-ferous metails. Shame it doesn’t discriminate between treasure and rubbish! Half a spoon, a belt buckle and a trolley wheel. Not exactly treasure! Well, not quite. I found an old mobile phone while digging in the garden. We have found lots of pottery and bits of china, but this is the first phone that we have found. It didn’t look in good shape. The battery had really deteriorated, so it was good to have it out of the ground. When I took off the back of the phone, I was a bit surprised to find the SIM and a memory card still installed. You can tell from the photo below that both were showing signs of having been in the ground. I wondered if I would find anything on the memory card. Or even if it could be read. Amazingly, it was a yes on both counts. 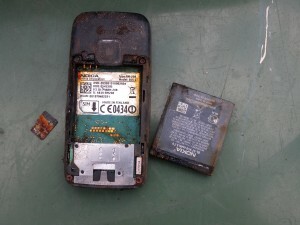 Looks like the phone was owned by a young boy who was into fishing, hip hop and air rifles. 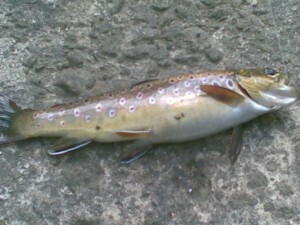 Below is one of his most notable catches. It is amazing what you find buried in the garden. Having removed the back and the battery, imagine my surprise to find the SIM and the memory card still installed. There is no chance of getting anything off that memory card. Or is there? One of the images left on the memory card. All dated 2009. Goodness knows how long the phone had been in the ground. When we removed the fireplace from No. 10, the fireplace was full of a lot of rubble – about 10 wheelbarrows of it! 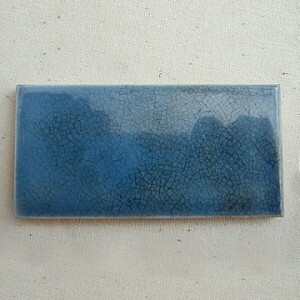 Amongst the rubble were some lovely rich blue Victorian hearth tiles – a sort of long oblong shape. Most of them were smashed and all of them were painted over. Presumably, the rich peacock blue colour had fallen out of fashion at some point and it was then fashionably to paint them over with beige paint – yuck! I saved some pieces and scanned one in (see below). I then thought I would do a quick search on the internet and see if I could find an image of a similar tile in situ with it’s original cast iron fire surround. Well, imagine my surprise when I found the EXACT same tiles on sale London Mosaic Restoration– the image is identical (see below). What an amazing coincidence! I did manage to find some images showing similar tiles in situ. I think the ones in the cottage are not going to be quite as fancy as these, but you get the idea. In the rubble behind the fireplace in No. 10, there were a number of peacock blue tiles. They orignially would have been in a Victorian fireplace surround. 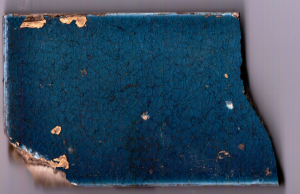 Tile from London Mosaic Restoration – it is identical (apart from mine is only a bit of a tile!). There are old beams throughout the properties, but all (yes, all) are boxed in. As such, we couldn’t tell what the beams look like or even the condition of them – it would not be unusual for these beams to suffer from woodworm or even worse. So we decided to take some of the cladding off in one of the cottages. The beams aren’t particularly unusual – rough sawn on one side and curved on the other. Presumably the curved shape is the natural shape of the tree. The beam had been coated in multiple coats of paint, probably distemper (a paint usually based on lime or chalk). Much of it was flaking and loose. A slight circular depression in the beam was a hole that had been drilled through the beam – probably 12mm across – that had been stuffed with newspaper and painted over. We pulled the newspaper out and gently attempted to unravel it. Unfortunately, it was very fragile and most of it disintegrated. However, we were lucky and we manage to salvage a very small piece with a date – 1858! Further investigation, revealed a much larger rectangular depression similar to the round one we found above. This one was a slot that had been cut right through the beam. Both sides were stuffed with newspaper and painted over. However, in the middle of slot behind the stuffed newspaper was half a broadsheet from the Leeds Murcury – also dated 1859! From the census records of 1851 and 1861, we know that David Hobson was living in this property with his family, so we had hazard a guess at who bought the newspaper originally. I found this when stripping the dry stone wall apart today. The Cannon Brewey opened in 1868 and closed in 1999. I reckon this one dates to around the turn of the century – crown bottle tops became popular after this date. I have spent the past couple of weekends clearing out much of the undergrowth and old trees from the orchard. I haven’t cut down any of the fruit trees, but I have taken out the other trees that had grown in between. It must have been years since any of this land was cared for. I can’t believe how much I have taken out of such a small piece of land. This space looks so mucher bigger now. I have left all of the sheds in place (for now) – there are two fairly large sheds here. Stihl 017 Chainsaw – Newly Serviced! ﻿﻿I did get my chainsaw serviced during the week and this has made a tremendous difference. Rapid Hire Centre in Honley (my local Stihl dealer) serviced it same day as well as fitting a new chain. I notice that they have also turned the guide bar over so it wears equally on each side (hence the Stihl logo on the guide bar is now upside down). They have done a great job and are local – very local. Shame their website doesn’t mention that they are a Stihl dealer plus their latest catalogue is 2010. 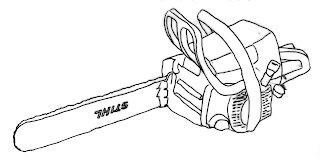 I am not a great fan of chainsaws. Pretty dangerous and things can go spectacularly (and disastrously) wrong if you aren’t careful. They need to be treated with care and respect. I tend to plan the cuts, clear the area, make the cut and then turn the chainsaw off before clearing the area and starting the process all over again. This means that the work is slow and methodical, but it also means that there is no debris in the area to trip over (I don’t even want to think about falling over carrying a running chainsaw!). There’s probably another day or so’s work here to tidy things up. As well as the over grown trees in the orchard, there is a large tree in the one corner with what appears to be storm damage. This needs tidying up. I made a start, but the light was fading fast. The smaller upper branches are now on a rather large bonfire. The more substantial pieces have been cut up into logs. It will be a year or so before they are ready to burn, but I am sure that I can find a good home for them!